Little change for Stormont "cabal"
The march of the DUP and Sinn Fein was delayed but not halted. By the end of the seemingly interminable count the DUP had picked up an additional two seats and Sinn Féin one, while the Ulster Unionists and SDLP relinquished two seats apiece. Turnout was down by almost 8% at 54.5% – higher still than the equivalent Welsh election but closer to Scotland – leading many commentators to point to high voter turnout at Troubles flash–points (86.9%, say, in Fermanagh South–Tyrone for Bobby Sands election in April 1981). One of the fruits of peace is a turnout level roughly in line with the rest of the UK. Chief Electoral Officer Graham Shields was not remotely sorry for the count problems, claiming delays were a by–product of three electoral processes taking place on the same day – contests for the Assembly, Councils, and the AV referendum (Northern Ireland voting with the rest of the UK‘s ‘No’ vote here). Presumably it has slipped his mind that counting for the council elections begin at the beginning of this week and so the Assembly situation is completely unconnected. Evidently Shields has learnt a thing or two from hanging around some of our more lacklustre politicians as their numbers come up. 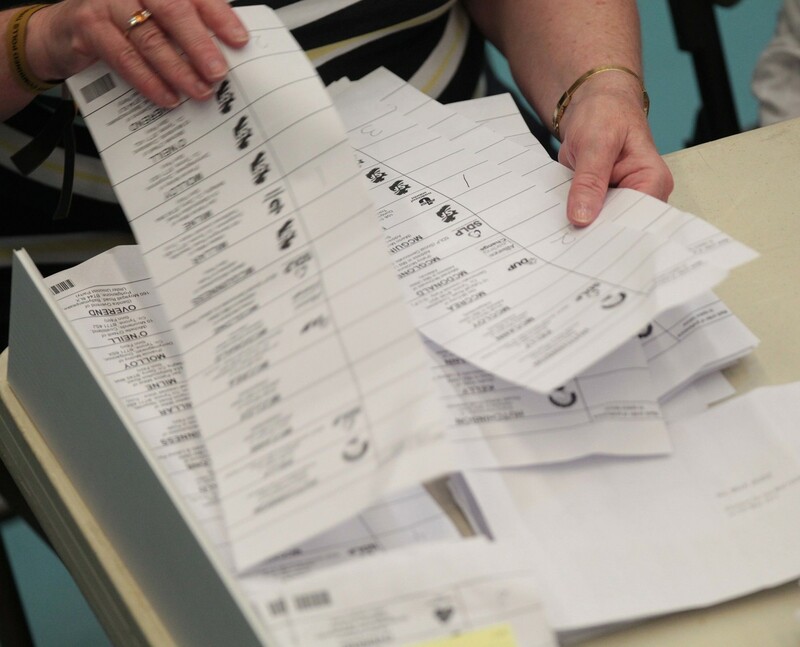 The DUP electoral machine in particular easily withstood the dip in turnout, acquiring new seats in South Antrim, North Belfast and North Down. As results began seeping in, Jeffrey Donaldson noted the steady decline of his old party’s vote since the Good Friday Agreement, estimating Tom Elliott has positioned the Ulster Unionists somewhere to the left of the Traditional Unionist voice (TUV). This proved bizarrely prophetic when, in response to taunts from the Fermanagh South–Tyrone audience during his victory speech, Elliott launched into an extraordinary tirade at Sinn Féin supporters, whom he labelled ‘scum’. This was immediately followed by a televised spat with that organisation’s John O’Dowd, a man who needs no encouragement when it comes to victimology. The big success story for O’Dowd’s party was Fermanagh South–Tyrone where Sinn Féin gained an additional seat to take three in total, along with Oliver McMullan winning the party’s first seat in East Antrim. Steady progress then for Sinn Féin, though notions of McGuinness as First Minister turned out to be well wide of the mark, something with it appears both Sinn Fein and the DUP knew was never a significant possibility long before the election. Despite recent conciliatory gestures Elliott, by accident or design, is sounding increasingly belligerent and determined to play up hard–line credentials. The UUP was not usurped (as some predicted) by the SDLP as the third largest party in the province, but Elliott will be looking over his shoulder. In one of the first declared results last Friday, Basil McCrea – who many regard as the altogether more modern, sympathetic politician – polled strongly and was elected on the first count in Lagan Valley (where incidentally Robinson’s organisation won an extra seat taking their tally to four – now the DUP’s West Belfast?). McCrea and Elliott are known to have a frosty relationship, their personal disposition matching politically diverging approaches: McCrea is something of a liberal unionist, Elliott a denizen of traditionalist Unionist backwoods. Michael McGimpsey held on in South Belfast, some recompense for his fraught Health portfolio, but long–serving chief whip Fred Cobain lost out to the DUP in North Belfast – a shame in a way as ‘Red Fred’ is one of the few left–leaning UUP representatives and the loss brings to an end a career of service stretching back to 1985. If the party sticks with Elliott as leader the Ulster Unionists know at least in what direction they are headed: down, strategically to the right, and away from participation at Stormont. In just as much trouble are the SDLP. Joe Byrne returned after an eight year hiatus in West Tyrone but many are now openly questioning whether the party made the correct decision in its choice of leader last year. Interestingly the SDLP lost three seasoned representatives outside the capital (Declan O’Loan, Thomas Burns, and Tommy Gallagher) but held all its seats in Belfast. Alasdair McDonnell – one of the few SDLP figures with any aura of past heavyweights – cantered in behind Anna Lo in South Belfast, although there are already rumours that he will vacate his Assembly seat in the coming months. Alex Atwood held his West Belfast seat with an increased share of the vote (seeing off the DUP with ease), and even McDonnell’s South Belfast running mate Conall McDevitt – despite campaign naivety and shaky public performances – held the second SDLP seat. The case of Alban Maginness is particularly instructive. His vote held up well in North Belfast against the prevailing wind and he appears to have benefitted from transfers from other parties. This is how Joe Hendron defeated Gerry Adams in the 1992 Westminster election, cultivating support and impetus outside the SDLP base. Opposition is another question entirely. Remember the SDLP has negotiated frontline politics in Northern Ireland since its foundation in 1970 and looks as if it could do with time out. But this too is linked to the leadership. As with Ritchie’s attitude to double–jobbing – which SDLP players do while simultaneously condemning – the reality does not match the rhetoric (this could be part of th reason why McDonnell may make an announcement soon). The party critiques the Executive at the same time as taking ministries; one foot in one foot out. If the party is smart it will return its leadership to the capital and withdraw to opposition benches, a real chance to recharge and redefine itself in modern Northern Irish politics – if. In the moment of the campaign for the Alliance Party Anna Lo topped the poll in South Belfast, a brilliant result and a vindication of her cross–community strategy. Elsewhere as expected Dawn Purvis and the PUP’s Brian Ervine split the progressive working class Protestant vote in East Belfast to hand the seat to Alliance. It is the first unsuccessful Assembly election for the PUP since 1998, while the absence of Dawn Purvis will be a blow for the new chamber. Early indications were that TUV leader Jim Allister may have missed out on a seat in North Antrim, a prospect which surely would have signalled the end for the TUV. However Allister did manage a seat and so the embers of that group will continue to burn, Allister promising to be a ‘thorn in the flesh’ of Stormont’s governing ‘cabal’. Steven Agnew held the Green Party’s one seat in North Down. The final results mirrored the leaders’ debates: the DUP and Sinn Féin are very happy together at Stormont, each to his and her own ministry. Seven of the eighteen constituencies saw no changes in parties or personnel whatsoever. Robinson–McGuinness are the new Paisley–McGuinness. More of the same beckons. But the abiding upshot is the continuing hegemony of the DUP and the regeneration of Peter Robinson just a year on from the private turmoil many predicted would finish him. As the weekend drew to a close he dedicated the result to the memory of Ronan Kerr, an exemplary final play in an election of personal triumph for the DUP leader.